A construction industry leader and founding member of the B.C. Construction Labour Relations Association, Mr. Paul Myers is widely considered an elder statesman for the industry. Throughout his construction industry career he has devoted his energies to the promotion of training and better working conditions for people in the trades and on maintaining labour stability in British Columbia. 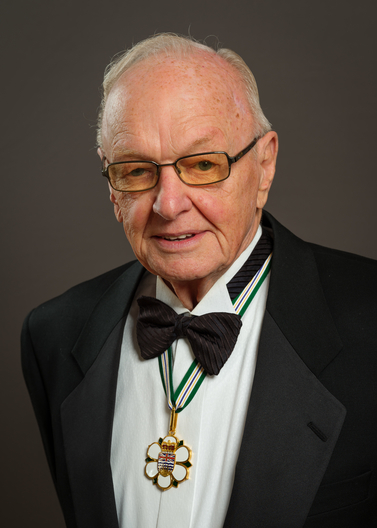 Mr. Myers is also a leading philanthropist having made a $25-million donation to the Lions Gate Hospital Foundation, the largest single donation to the hospital’s foundation in B.C. history and one which inspired many others to contribute to the replacement of the aging inpatient tower. He began his career as a plumber and over the course of 60-plus years went on to buy the company he worked for — Keith Plumbing and Heating Co. Ltd.— and grow it from being a residential plumbing contracting business to an enterprise that is one of the largest mechanical contractors in the province. In 1977, Mr. Myers opened an office in Whitehorse, and a little more than a decade later launched Keith Panel Systems Co. Described as a visionary and compassionate leader who treats his employees with respect, Mr. Myers achieved his entrepreneurial success while raising his four children on his own after his wife suffered from a debilitating illness. In 1970, Keith Plumbing and Heating Co. Ltd. was one of the founding members of the B.C. Construction Labour Relations Association. At that time, strikes and lockouts involving the 15 unions of the B.C. construction industry were frequent. The association was aimed at bringing stability to the industry, and it was very successful, becoming a model for other provinces. Mr. Myers served as a board member of the B.C. Construction Labour Relations Association for many years, and also became known as a well-respected negotiator. He is a private person who prefers to work in the background, but his contributions have been recognized with many awards including the 2012\2013 Industry Leaders Award from the Construction Labour Relations Association. In 2011, the North Vancouver Chamber of Commerce presented him with the Best Business Award for his company’s business principles and practices, as well as its training and care of staff. In both 2006 and 2015, Mr. Myers was honoured with the Vancouver Regional Construction Association’s Lifetime Achievement award.